Mark is a creative director with over 17 years of experience in all forms of advertising. Throughout his career, he has passionately focused on designing breakthrough ads, inspiring creative teams, and creating one-of-a-kind, award-winning campaigns. From starting at Dome HK as an art director to working his way up to creative director at Razorfish and Omobono, Mark has relentlessly pursued mastering his craft. Just a few of the tools in his toolbox include: managing campaigns from concept to delivery, collaborating with others to create a dynamic and ambitious culture, and leveraging brand assets to capture their true essence through multi-channel creative initiatives. 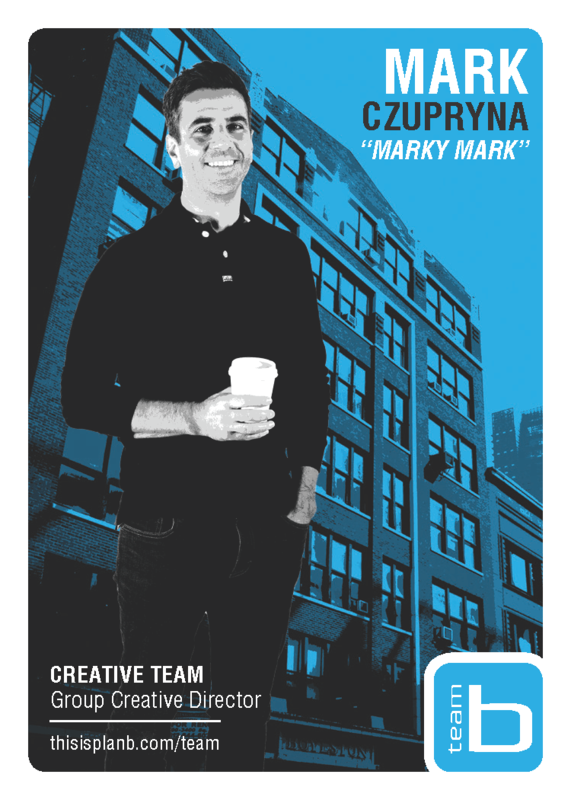 An all-around team player in the advertising world, Mark also prides himself on his keen eye for design, his desire to utilize the latest technologies, and his drive to create memorable, on-brand work. Before he joined the Plan B team, Mark helped to create a number of successful campaigns for notable brands, including: SAP Fieldglass, JLL, Motorola, Accenture, Capri Sun, Samsung, Kraft, and State Farm. And his work has not gone unnoticed, as hi trophy case includes a WOMMY, Bronze Anvil, and a Pegasus Award, as well as the pride of having been a finalist for Cannes Lions. With his valuable skills in producing and overseeing exceptional creative, Mark will work on accounts such as McLaren, Keiser and a number of other brands under the Plan B umbrella. When Mark is not working on campaigns, he enjoys spending time with his family, watching a Cubs games at Wrigley Field, and sipping on a hot cup of coffee.